HISD’s College Readiness department wants every 11th-grade student to know that practicing and doing well on the School Day SAT could pay off in extra incentives, including scholarships and materials for college. The department launched the School Day Incentive program for the Class of 2017 on Wednesday, kicking off the countdown to the School Day SAT on April 12. The purpose of the program is to increase student participation and scores for the School Day SAT, thereby increasing student access to higher education and money for college. There are two ways for students to get incentives through the School Day Incentive program: both individually and as a group. As a part of both contests, students must practice on the KhanAcademy.org/SAT daily. 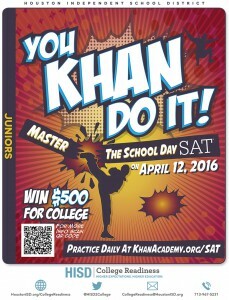 Any HISD 11th-grader who earns 50,000 or more energy points on their Khan Academy SAT practice account can apply for the You Khan Do It scholarship. By applying by April 1, HISD students can win a $500 scholarship. 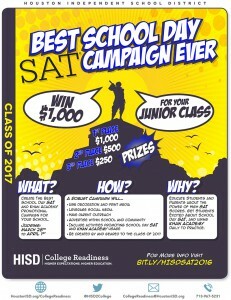 The Class of 2017 at each high school campus can create their very own Best School Day SAT Campaign Ever by working as a group and submitting the application by March 23. The campus with the best campaign will win $1,000 for college bound materials or activities. The second place campaign will win $500, and third place will receive $250 dollars. call 713-967-5231 or email collegereadiness@houstonisd.org. This entry was posted in College Readiness, High Schools, News and tagged SAT on February 12, 2016 by HISD Communications.